I found these color-fabulous bowls at Bisou and after falling in love with them, I read that they were in the May issue of Domino magazine. I scour every single issue like it's the last, so I'm not sure how I missed them, but whatever - they're 100% cuteness. 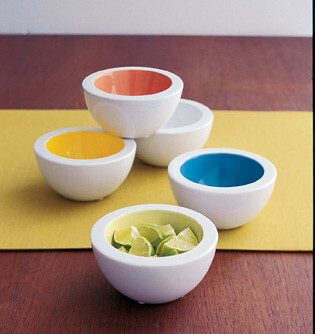 I'd love to whip up some yummy dip and use these bowls for happy hour at my house with a few cocktails. Crafted from ceramic, glazed in vibrant colors like honeydew, sky, terra and yellow, you can pick up a a set of 4 for $20 - perfect for your next informal gathering at home.